Breed Group: Sporting Weight: 34 kgs Height: 90 cms Color(s): solid black, yellow, or chocolate Coat: The Labrador Retriever is a double coat breed. The outer coat is straight, short, very dense, and hard in texture. The under coat is soft, weather-resistant, and protects this breed from cold, all types of ground cover, and water. The color of the coat comes in chocolate, black, and yellow. 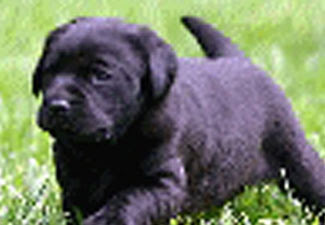 Distinct feature: The Labrador Retriever is medium in size, strong, athletic, and well balanced. They are friendly, outgoing, and possess an extremely sweet personality. This sporting breed is adept at hunting and retrieving. Labrador Retrievers are revered as companions and highly respected for their loving nature. Temperament: This breed is highly intelligent, loyal, and deeply devoted. The Labrador Retriever is reliable, affectionate, and thrive on human companionship and attention. They are absolutely wonderful with children and get along exceedingly well with other dogs. They may be reserved with strangers and make good watchdogs. Activity: Delightful, high-spirited, and energetic, the Labrador Retriever requires a great deal of exercise. They enjoy family play sessions, securely leashed walks, swimming, and a safely fenced yard to run and romp freely. This breed will do okay in an apartment dwelling provided they are given sufficient exercise, attention, and stimulation.